Ooh La La...Disco King Bappi Da! Every time a musician enters the film industry, we often think if she/he would survive the growing demands of the listeners. Every film that gets made or canned has multiple music directors and singers. Gone are the days when one singer or one music director would carry the burden of audio sales. In spite of the technological change, each music director has a unique identity. The individual, a trendsetter who made us realize that the feet were meant for disco, was unique in his own way. Not only did his music have the bling in its beats, his tryst with fashion was also bling! Welcome to the world of Bling! Bling! Bappi da! I must confess - this was one of the most enjoyable conversations I have ever had. 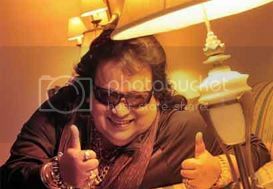 Excerpts from the interview of Bappi Lahiri, Bollywood Music Composer and Singer with Anu Gopalakrishnan, Radio Jockey:	Rockin’ Raaga (WCXI 1160AM) – An miindia.com exclusive. When did the transition from Alokesh Lahiri to Bappi Lahiri happen? BL: I was born in Calcutta and I come from a very classical background with my parents being very established singers. I have completed 40 years in the music industry and have been composing since Kishore Kumar and Manna De. I was four years when I used to play the tabla. I played for Lataji and she blessed me. Everybody at home nick named me as Bhappi and when Lataji started calling me by that name, the entire industry thought I was called Bappi, sounded very chirpy as I was very young and the name stuck on. So from Bhappi to Bappi da to Bling Bling Bappi da – I liked it as people enjoyed calling me that way. Your experience in the disco genre created a new trend in the music industry. How did it all happen, especially when you had a classical background? What is the most touching album you have ever made? BL: I have done 466 films so far – Hindi, Telugu, Malayalam, Bengali and Tamil. You asked me a very difficult question because for every musician, every album is touching. For me, I do have some touching moments with a few albums: Sharaabi with Amitabh Bachchan (Inteha Ho Gayi Intezaar Ki), 70’s song from the film Chalte Chalte (Mere Ye Geet Yaad Rakhna). I have a very special attachment for Disco Dancer, Namak Halal (Ke Pag Ghunghroo Bandh Meera) and Tohfa. One other song is a Bangladeshi number by Runa Laila. This is a non-film album called Suparna. BL: Several music directors and singers have come and gone. I have survived for 40 years because of family support and divine support. What I am today is a blessing given by god. I like to compose music and my wife has been there for me in challenging moments. If I am able to create music that makes small children to middle age people to old adults dancing, it is because of the pulse which I think is given by god. I also have fond memories of Taxi No 2011, Maniratnam’s Guru and Golmaal 3 where I rehashed the “I am a Disco Dancer” number. I am also very glad that the album “Walking on Love Street” is on the top ten of the US Chartbusters. It is all because of the god up there. an ode to his wife Chitrani, is among the top ten chartbusters in the US. Your first tour to the US was in 1979 and this is your first concert in Michigan in 15 years. Is it correct? How does it feel? BL: That’s absolutely correct. You have all given me such a warm welcome. I am very excited about Michigan. I would love to sing all my popular numbers. I am ready to disco, are all of you ready? I have lots of songs to share with you after a long time, including “Ooh La La” from The Dirty Picture. Tell us about your fascination for gold. BL: Gold has been very lucky for me. Most of the jewelry that I wear is spiritual pendants. I have one which was given to me by my mom. It is a thick gold chain with Ganeshji pendant. This was given after my first film Zakhmee right after Lataji sung my song in that album. Since then I have been fascinated by gold. I am also the fan of Elvis, so I ended up with the bling. God has been very kind to me and all the pendants I wear are symbolic of all the special events in my life. They were given by my mom, my wife, and my children. It came with a lot of “dua” (meaning Prayer). Gold has nothing to do with my personality. I am a spiritual person and I want to be known as a good human to all. That is what matters to me. You love introducing new talents in the music world. You have been a secret benefactor to superstar Akshay Kumar, is that correct? BL: Akshay is a very humble and nice boy. He was a black belt and he came to me with a picture in hand. I did Koi yahan nachen nachen with Usha Uthup, I worked a lot with her. Similarly, gave a lot of songs for Alisha Chinai, Sharon Prabhakar in their early days. I also introduced Vijay Benedict, Babul Supriyo, Bali Braham Bhat, Salma Agha, Runa Laila and others to new trends. I have a lot of aspirations for Mika who has even sung “Kammo Kammo” in the yet to be released film Department which has music by my son Bappa. Tell us about your most recent super super-hit “Ooh La La” from The Dirty Picture – how did that happen? Did you envision it to be a super international hit? BL: Jeetendra is a good friend of mine. When Milan Luthria met me, he wanted to re-create the 1980’s charm of Sridevi-Jeetendra. We spoke for a while where Milan mentioned that he wanted a total 80’s ambience. The Bappi Lahiri of the 80’s was what he wanted. He wanted me to sing. I am nothing like Kishore Kumar. I just created a masti song. If you ask me, there is only one singing genius – Kishore da. So, in order for me to create the Tohfa and the Himmatwala experience, Ooh La La happened. I just recreated the Oi Amma from Mawaali. I am grateful to god for giving me that direction to create another memorable hit. I have become very choosy. At a point, I was doing 37 films a year. It all happened randomly. But now I am very choosy. I want to compose quality films. 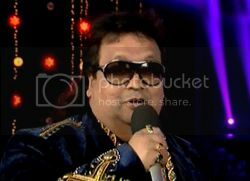 Will Bappi da win the Grammy this time? Tell us about your international collaborations. BL: I was nominated twice earlier. Once for “Jai Ganesha” and the second was for “World Peace, Love and Harmony”. Walking on Love Street is dedicated to my wife. Let us see. So far, the album is getting very good reviews. If you remember, my international collaborations started way back in 1998 when I brought Samantha Fox for Rock Dancer. I also collaborated with Boy George and Apache Indian. So whatever is happening right now was done by me 13 years back. 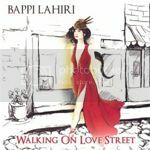 I have pinned my hopes on “Walking on Love Street” – it is very popular in Michigan, LA, Chicago and Texas. I am also working on some nice Bengali films with Mithunda and Prasanjeet. 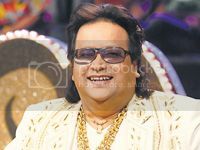 Bappi Lahiri will always be a trendsetter of the Indian Music Industry. With “The Dirty Picture” he has firmly set his footprint as the true Disco King of India. A very fun and amiable person, the singer was all excited about his forthcoming concert in Michigan. 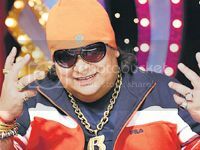 As disco beats resonate, Bappi da ended the conversation by singing the much acclaimed “Ooh Ooh La La”. Thanking Sudip of Dreamz India for coordinating and bringing him close to his audience, Bappi da also thanked Ashiesh Tikiwala of Aavishkaar Entertainment for arranging his tour to Michigan. Join this spectacular concert with the one and only Bappi Lahiri sharing his memorable repertoire. For event details, click here. Buy your tickets now!